Chef Psilakis is a big proponent of teaching kids to cook. That was actually a theme that was thread throughout the two days. Dr. Gianluca Tognon talked about how they improved the diet of school children in Sweden. They empowered children by involving students in the meal planning and offering them choices. They exchanged information by inviting school chefs into the classrooms. And, they evaluated the effects of what they were doing by keeping track of foods that were not well accepted and collecting feedback from students and teachers. He suggested food tastings, having specially themed food days, creating "smarter lunchrooms" by carefully considering food placement and having school gardens as ways to improve dietary habits of children. Dr. Tognon has a free e-book that I look forward to reading. UMass shared what they did at the university level and it really didn't sound all that different. Ken Toong the Executive Director did add a mention of "stealth health" for example making sliders with a meat blend that's 30% mushrooms. At UMass they've found a way to make healthy affordable. They have 12% waste and the US average is 40%. He also reported that they consumed 22% less soda from 2013 to 2014. They encourage students to drink water by offering sparkling water and water infused with fruit. (I'm already requesting that we do that in our office.) I loved the UMass tagline -- Come for the food, stay for the education. I sure didn't have lobster when I was in college. Many people know they should change what they eat and move more, but feel "stuck" and lack the skills to change. Nutritional knowledge is not enough. Culinary literacy is at an all time low. Hands-on training is essential. Each 30 minute reduction in time spent cooking in the US has been associated with an increase in BMI of 0.5. "Across socioeconomic groups, people consume the majority of daily energy from the home food supply, yet only slightly more than half spend any time cooking on a given day. Efforts to boost the healthfulness of the US diet should focus on promoting the preparation of healthy foods at home while incorporating limits on time available for cooking." I had a chance to observe this first hand when we did our Mediterranean Challenge. Many people really struggled with the cooking. Grocery shopping took a long time because they were looking for items that were unfamiliar to them. The kitchen prep work took a long time because they weren't set up for it and their knife skills weren't good. And, they often picked meals that were too ambitious for a week night because they didn't have enough experience judging what could be prepared quickly. I've been planning to organize a knife skills class and a series of cooking classes at ASHA since I learned this. From what I learned at the conference, I'm on the right track with this idea. The experience of Todd LeDuc at the Boston Fire Service affirmed something I believe, money is not the best motivator for improving healthy. They started out with some incentive programs that they later eliminated. He shared an example of a communication that I liked, if you eat x you'll have to run x miles to work it off. How much more useful would that kind of message be than our current food labels? One of the most exciting presentations was David Eisenberg, MD, he hit on many things that I'd been discussing during the breaks with other attendees. He has a program that teaches physicians too cook -- Health Kitchen, Healthy Lives. You can read about it in this New York Times article. I'm wondering how many of the program objectives we could incorporate in our workplace wellness program. Dr. Eisenberg was the first to mention mindfulness. I emailed him and asked if he'd share his slides. I'll definitely be spending some more time reflecting on what he shared. "Eating foods in their season, when nature intended, brings anticipation, which in turn teaches us to savor and enjoy the moment, a notion obscured by the 24/7 availability of almost everything in American supermarkets and the erroneous -- and, ultimately, unsustainable -- belief that it's our right to have it all in endless choice." Chef Michael Psilakis described the Mediterranean as the “have your cake and eat it to diet” and they practiced what they preached. Breakfast was served both days of the conference – Fage plain greek yogurt, fruit, honey, pistachios and veggie filled filo pastries. Lunch was 90 minutes long. It included chicken, farrow, eggplant, salad and wine (no dessert.) Snacks and appetizers were fruits, roasted vegetables, hummus and more filo pastries. I’ve never eaten so well at a conference and all in the name of health. What’s not to love? They also closed the conference with a Greek Food Expo that gave us a chance to try wines, olive oils and other treats imported from Greece. With the focus on diet, I don't want to neglect the fact that activity and sleep were mentioned. I sat next to Voula Manousos, a registered dietitian, and she described our need for sleep in an enlightening way. She suggested you imagine your bedroom with everything pulled out of the closet and drawers heaped in the middle of the floor. While you sleep, everything is neatly put away where you can find it the next day. That's why sleep is such a critical component of memory and recall. On that note, I think I'll say good night. I recommend trying the oils from Flying Olive Farms. They're available in Whole Foods in the Raleigh, NC area and I'm begging the Wine Cabinet in Reston, VA to carry them. I loved their balsamic too. I recommend the series of Huffington Post articles written by the conference organizers and faculty. Dr. Gourdine met with us yesterday to teach us how to seek and find the best medical care. This was Dr. Gourdine's second visit to ASHA. I shared a little about her impressive background when I summarized her last presentation How to Be the CEO of Your Health. 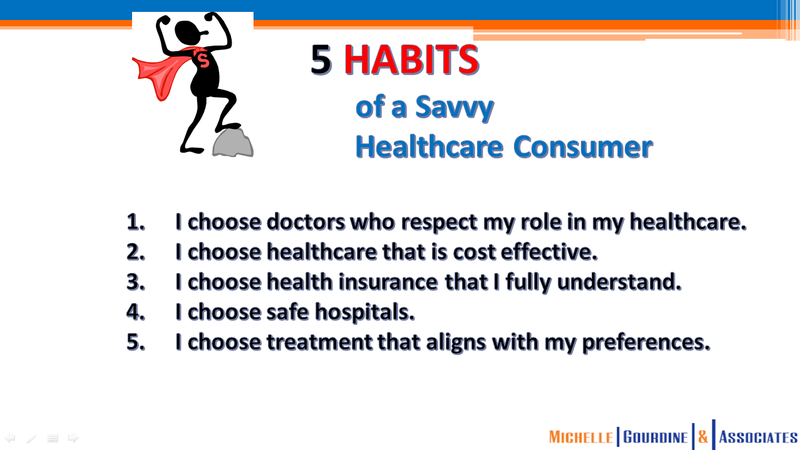 Distinguish among an empowered patient, an engaged patient, and a savvy healthcare consumer. 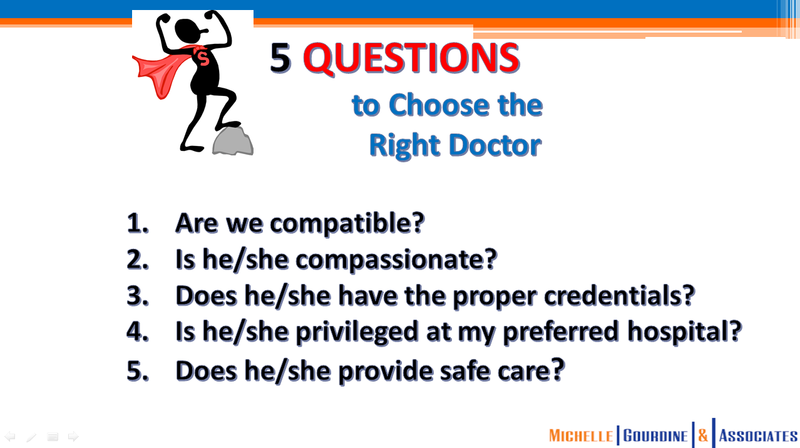 Identify and use reliable sources for choosing the best doctor. Talk to our providers about safe care. Identify and use reliable sources for choosing a safe hospital. Define the role of a hospitalist. Seek care from the highest quality hospitals and facilities when they need it. Are educated about procedures and alternatives. Estimate the total cost and out-of-pocket costs of their care. So, what is quality healthcare? There are two main types of quality measures -- consumer ratings that tell you what people think about the care they received and performance measure that evaluate how well a doctor, health plan or hospital prevents and treats illness. Many of the resources we first think of like publications that list top doctors are more popularity contest or paid advertising than an indication of quality. Dr. Gourdine provided us a number of reliable resources to help us select top quality doctors and hospitals. So, how do you chose a doctor? First, identify your own health priorities. AHRQ has a nice tool. Look at the Unitedhealthcare website to find providers that are in-network. Look for providers that are designated as Tier 1 which indicates that they have received a premium designation for quality and cost efficiency. Review information on the AMA website. Many doctors are not AMA members. You can still find them in the directory, but there is limited information about them available. Check out the doctor on Health Grades to learn more about their background and read reviews from patients. You can also look at the Medicare physician compare website. 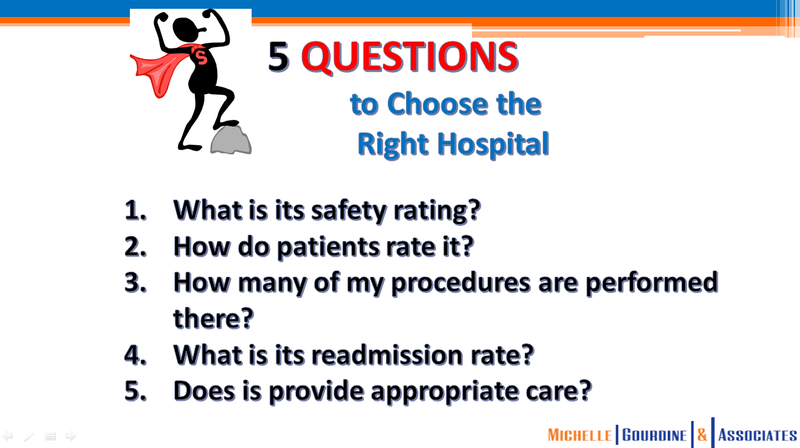 What reliable resources are available for choosing a hospital? The Joint Commission has a good reference list of questions to help you choose high quality hospital care. And, a lookup tool to compare hospitals. I don't find this tool helps me distinguish the options very clearly, however. CareChex is a comprehensive site that I've used and recommended. It allows you to hone your search by clinical category. Leapfrog Group (my favorite) distinguishes the options very clearly with letter grades and has a handy app called Hospital Safety Score. Dr. Gourdine has compiled a more comprehensive list of resources in the last few slides of her presentation. I encourage you to take a few minutes to view it. We look forward to having her back at ASHA next year. If there is a particular topic you'd like to have her speak about, please let me know. We feel very fortunate to have someone with her expertise available to help us. saw at Motley Fool are the greatest! When we implemented EBIX as our online benefits enrollment system two years ago, we switched flex vendors to FlexCorp because they were business partners. Flexcorp had already been acquired by TASC (Total Administrative Services Corporation) at that time, but they operated independently. Because Flexcorp was fully integrated with EBIX, we had a single sign-on. Our staff were happy with FlexCorp. They appreciated the single sign-on and the requested levels of substantiation seemed reasonable. From the admin side of things, Flexcorp was ok. Their responsiveness wasn't great, but it wasn't causing many problems. We planned to continue our relationship with them into 2015. In August, our staff started letting us know they couldn't log on to their accounts and we couldn't get an explanation of the problem from FlexCorp or an expected time frame for fixing it. On August 11, we received an email that FlexCorp had joined forces with TASC and they would be transitioning our account. TASC had actually acquired Flexcorp in December of 2011. For reasons unknown to us, they decided to move our account to TASC midway through our plan year. I didn't know much about TASC when we received this notice, but I contacted our broker, Mark Sager at Alliant, immediately and asked him to help us look at other providers. I figured if we were going to have to change vendors, why not look at all our options. We had a call with TASC on September 12. It didn't go well. They couldn't answer any of the questions we asked. I called Mark again and told him we needed to find a new vendor FAST. 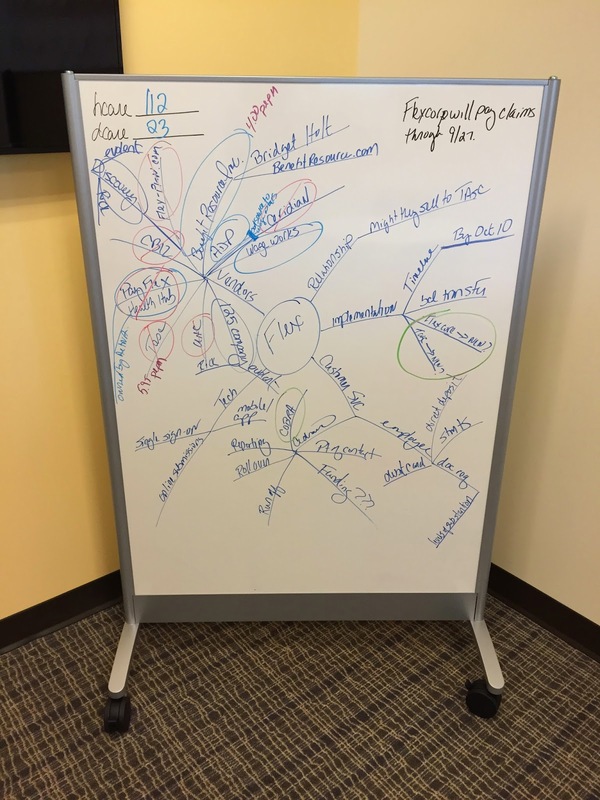 Our team got busy and mapped out the plan you see in this image. I sent out an SOS to the HR directors at other large associations and made note of who they had experience with and who they liked and didn't. The feedback about TASC was not good. (Evidently they've acquired a lot of other flex vendors recently.) Connie Castrogiovanni, our payroll guru, set up a meeting for us with ADP. I posted questions on LinkedIn and got a few responses that helped me hone the list a bit more. On September 16, Mark Sager brought Bridget Holt from Benefit Resource, Inc. out to meet with us. They're a small firm in Rochester, New York that seemed to be a good fit for us. At the end of the meeting, we asked Connie to hold the next transfer of funds to FlexCorp. We figured there was no sense giving them funds that we would just have to collect back. Benefit Resources' references stressed the quality of their customer service. We like their app that allows participants to submit claims or receipts necessary to substantiate a claim right from their phone. And, they could meet our ambitious timeline for making the transition, so our staff had access to their funds in less time than they would have if we'd made the transition to TASC. We quickly executed the contract and they had us up and running in record time. What we couldn't do is shut down the process with TASC. Of course we informed them we would not be making the move -- verbally and in writing. But, they didn't seem to get the message. They continued to email our FSA participants, so we blocked incoming email from TASC. They even sent debit cards to our staff. We did a pretty good job of keeping the staff informed about what was going on, but TASC certainly did everything possible to confuse matters. It was a real scramble and certainly a lot of work that we had not planned on at a particularly busy time for us, but we got it done. Most employers would have just gone along with the transition to TASC, but there is no reason to be a victim if you have a good network of people that will help you when you're in a pickle. I had the good fortune to attend the Mediterranean Diet and Workplace Health Conference at the Harvard School of Public Health. Someone there evidently Googled “Mediterranean diet workplace wellness,” stumbled across my blog, and sent me an invitation. (Now that's an incentive to keep blogging.) I’m pretty confident I was the only HR person in attendance, so this was a pretty unique learning opportunity for me. The first day was entitled Challenges: Diabesity and Contemporary American Nutrition and Value of the Mediterranean Diet. Day 2 was Promoting Dietary Change: Workplace/School Solutions and Other Best Practices from the Field. I walked away with a lot of notes, so I'm breaking them up into two posts. This post will cover Day 1 and a second post will share what I learned Day 2. They clearly defined what it means to eat Mediterranean. I've plunked the main points into the box above. I actually learned a lot about olive oil. Look for EVOO, extra virgin olive oil. It should be labeled cold pressed and first pressed. Then, check the ingredient list. A lot of what is sold as olive oil in the U.S. is a blend of oils. Interestingly, in Greece they never mix their olives. Each bottle of olive oil is made from olives from one of three regions Kalamata, Crete, etc... It was suggested that we use a good, but less expensive olive oil for roasting vegetables and other cooking and then have some really nice oils for finishing dishes. Olive oil does have a low smoking point, so if you're making a dish that involves high heat, it was suggested that we use canola or grape seed oil. Interestingly, there is no relationship between milk consumption and fracture risk. It was pointed out that the highest rates of fractures are in milk drinking countries. We were told that calcium needs are overstated in the U.S. (Guess we can thank the dairy lobbyists for that.) Yogurt and cheese are the healthiest way to consume calcium. It was pointed out that in Greece, they don't eat much cows milk cheese, it is usually made from goats milk. They defined a moderately high intake of fish as two to three servings a week. I was also happy to hear some definition around "moderate consumption of wine." It was defined as one drink per day for women and two drinks per day for men. A drink can be 12 oz of beer, 5 oz of wine or 1.5 oz of spirits. (There were no special health benefits noted with red wine, so choose what you like.) You should consume your drink slowly. They also clarified a question I'd heard asked on a number of occasions. Most people can safely have up to three drinks in one day as long as they don't exceed the weekly limit of 7 for women and 14 for men. They talked about the health benefits of eating nuts. All nuts, which was refreshing. I've so often heard we she eat this nut or that nut, but all nuts have health benefits and I guess you're sort of splitting hairs by picking one over another. 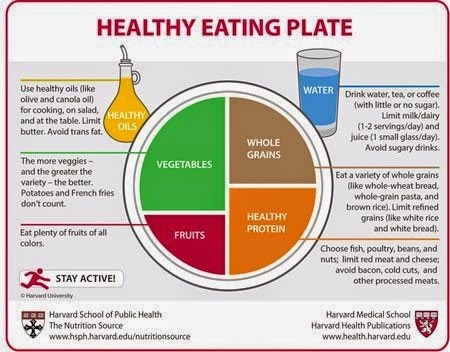 Nutrition experts at Harvard School of Public Health developed this Healthy Eating Plate to address key flaws in the U.S. Department of Agriculture’s MyPlate. I found the graph below rather shocking. 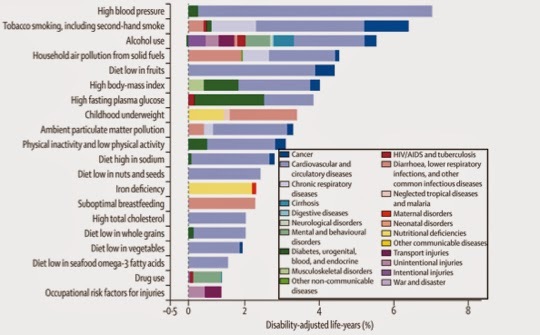 Of the 20 leading causes of death worldwide, 14 are linked in some way to food, diet and nutrition. Notice how high a diet low in fruits ranks. We were told that each additional serving of fruit a day results in 5% reduction in the risk of diabetes. Volume is more important than variety. Juice doesn't count. Click on the link in the caption if you'd like to learn more about the graph. A recent article in JAMA stated, "inadequate intakes of minimally processed foods such as fruits, nuts, vegetables, fish and whole grains together are associated with larger proportions of global death and disability than excess intakes of started fat, trans fat, and sodium." This reinforced that what we eat matters more than what we refrain from eating. I certainly find eating healthy easier when I focus on what I "do" eat rather than on what I "don't." 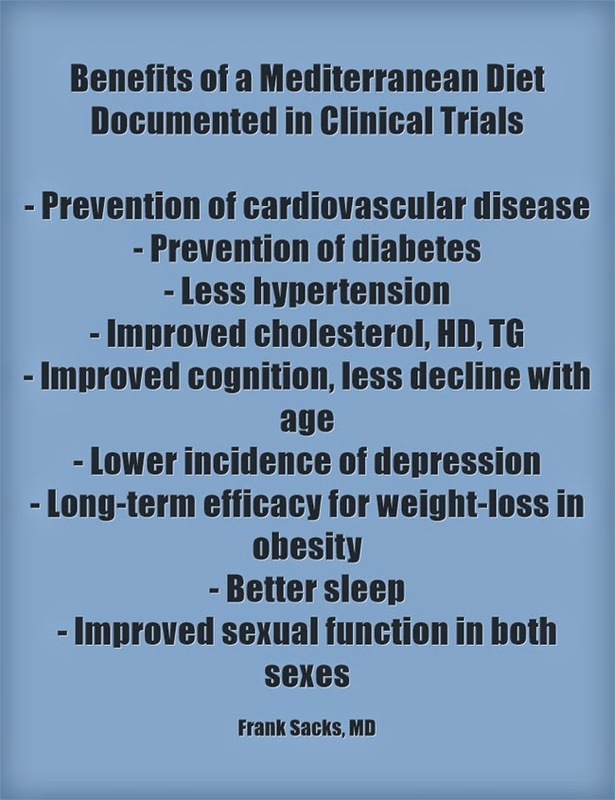 There was a presentation by Frank Sacks, MD on randomized clinical trials that was interesting. He was the perfect speaker for after lunch delivering what could have been a dry and complex topic in easy to understand terms with plenty of humor. He said you get the best results lowering blood pressure by combining a low salt and Mediterranean diet. EVOO matters and all nuts have a similar benefits. (Chef Diane Kochilas said olive oil makes vegetables craveable. She has a new cookbook coming out on October 14 that I can't wait to receive.) 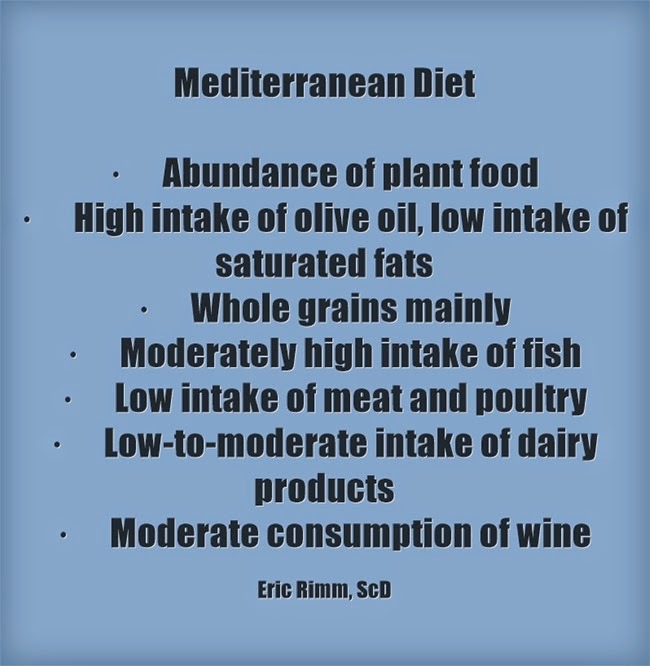 He showed a slide that summarized the benefits of a Mediterranean diet that have been documented in clinical trials. I recreated that info in this image. That pretty well summarizes Day 1. During Day 2, the focus shifted to how we help people eat a Mediterranean diet. I'll summarize what I learned the second day in my next post. If I've peaked your interest in olive oils, read Tips on Finding the Best Olive Oil With Eataly Expert Nicholas Coleman. I recommend trying the oils from Flying Olive Farms. They're available in Whole Foods in the Raleigh, NC area and I'm begging the Wine Cabinet in Reston, VA to carry them. I loved their balsamic too. I also recommend the series of Huffington Post articles written by the conference organizers and faculty. Open enrollment is just around the corner and ASHA staff will be selecting which of our three health plans are the best fit for themselves and their families for 2015. To make the decision process a bit easier and more transparent, we created this decision making tree. 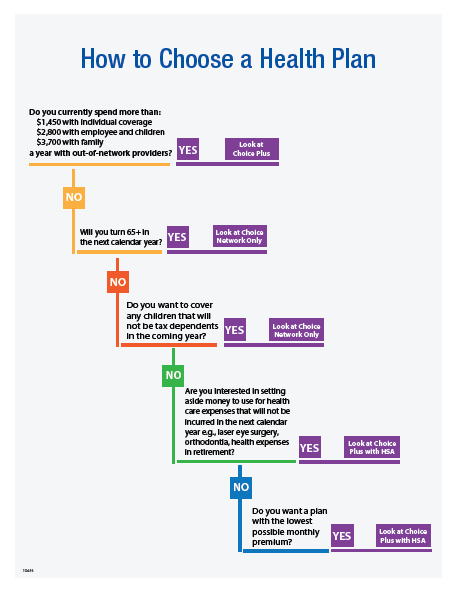 We've also revamped our plan for open enrollment meetings to follow along the same lines as the decision tree. We'll be holding a brief overview meeting and then staff members can chose to attend any combination of the following sessions. They'll each be offered more than once and include a presentation and a panel discussion with representatives from our insurers and staff. We'll also hold a separate meeting for retirees. Staff nearing retirement are welcome to attend. We hope everyone will seize this opportunity to make a well-informed decision. Many employers move to self-insure the medical plans for their employees once they reach a certain size. With a large enough group, it becomes less expensive to pay the actual medical claims and an administrative fee than to pay premiums to an insurance company to assume the risks associated with fluctuations in claims. 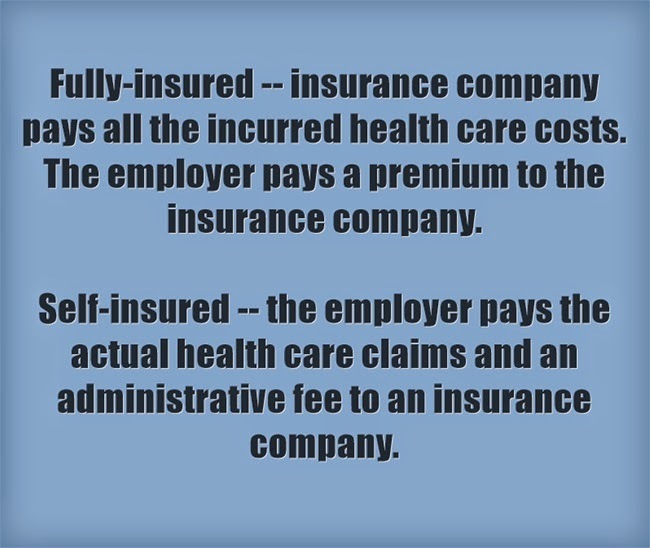 Self-insuring also allows an employer more flexibility in the plan design and allows an employer to avoid some of the taxes imposed on fully-insured plans. How a plan is funded is largely invisible to the staff. For example, ASHA has been self-insuring dental coverage for years and I doubt most staff have given it any thought. In 2015, staff will notice a few changes though. Our coverage will still be with UnitedHeathcare, but UMR (a different group within the company) will be handling our account. Therefore, we will all be issued new cards with new contact information. We'll be explaining all this and more during our open-enrollment meetings in November. Please plan to attend. As always, spouses are welcome.